Ben Zabo - "Ben Zabo"
Malian Afrobeat may be two words that you don't hear together very often but 2012's most exciting new Afrobeat band may well be hailing from Bamako, Mali. 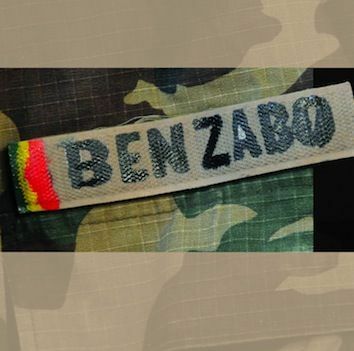 Named after their bandleader, Ben Zabo, they are about to release their self-titled debut, an album full of funky and gritty tunes, wonderful musicianship, and songs of peace and hope that could not be more timely or necessary. The album is also a testament to the lesser-known culture of the Bwa people; it is the first international release of a Malian of Bo descendant with all songs in the Bo language and rhythms. Born into nobility in 1979 in the Segou region of Mali, Ben (real name Arouna Moussa Coulibaly) chose music as a career because of his passion, but against the wishes of his parents who wanted him to pursue a career as a pharmacist. In 2007, whilst trying to establish himself as a guitarist, singer and songwriter, Ben also started working as an assistant sound engineer at the famous Studio Bogolan in Bamako. It was in this studio that he first met Peter Weber, owner of the German-based Glitterhouse Records, and Chris Eckman, American music producer, leader of acclaimed US band The Walkabouts, member of Dirtmusic, and collaborator with Willard Grant Conspiracy and many other bands. Weber and Eckman were at the studio on several occasions, to record Tamikrest's albums 'Adagh' and 'Toumastin', Dirtmusic's 'BKO' and the late Lobi Traoré's 'Rainy Season Blues'. They were blown away by Ben's enthusiasm, drive and talent. Weber agreed to record and distribute Ben Zabo's debut album for the international market, with Eckman producing it, again at Studio Bogolan. songwriter tropes of Rokia Traore and the dusted, acoustic meditations of Tinariwen (on their most recent album) are a demonstration of this point. Even the later albums of the once exuberant Salif Keita have grown more melancholy and ethereal. The music of Ben Zabo is a clear break from this quietude. His music is a string of firecrackers igniting on the dance floor of a midnight party. It is a music that has been perfected in the loud, sweaty, open-air clubs that line the outskirts of Bamako, places where the competition to get heard is fierce, and the chances of moving upward and outward are next to none. When I first came across Ben's music it seemed unlike any contemporary Malian music that I had heard. Its direct physicality, its polyrhythmic complexity and its raw but focused energy set it apart. But as I dug more into Mali's musical past, I realised there are antecedents for the music Ben and his band create. with the urban (and often western) sounds of the fast growing cities. Electric guitars and James Brown motifs stood side by side with age-old storytelling. It was a music made out of a complex dialogue: the village reaching to the city and the city reaching to the village. And while it would be too simplistic to gather all such music under one name, due to Fela Kuti's pan-continental influence and his coinage of the term, much of this music came to be known as Afro-beat. In Mali, during that fertile time, artists like Moussa Doumbia, Le Super Djata Band du Mali, Super Biton de Segou, and Sory Bamba and his many groups (especially L'Orchestre Kanaga de Mopti) were articulate, original purveyors of this cutting-edge musical experiment. Just to satisfy my own curiosity, I once asked Ben Zabo if he had ever listened to Afro-beat and its Malian offshoots. His face lit up and his answer was quick and to the point. "I have listened to too much Afro-beat!" he said, grinning. He went on to acknowledge the deep debt he felt towards the musicians (of all stripes) that have come before him. On another occasion Ben proudly told me that his Malian "Afro-beat" forbearers Super Biton de Segou and L'Orchestre Kanaga de Mopti, had both incorporated the unique Bwa rhythms from Ben's own minority ethnic group, the Bo people, into some of their classic songs, even though those artists were from a different ethnic background. cultural legacy recognised. They are funky, charismatic and committed. They are not going to give up easily. Ben Zabo and his band have a mission which they intend to accomplish through their music. It is to promote their Bo culture at a national, African and international level with music, dance and Bwa traditional apparel. The name "Ben Zabo" means "son of Bo and Bambara" in Bomu etymology, evoking his belonging to the double cultural identity Bambara and Bo. While perpetuating the traditions of his native Bwatun, Ben Zabo developed a mixed style of rhythms and melodies of Bwa in which one can detect sounds and influences from other modern and western musical styles: Afrobeat, funk, reggae, blues, rock and even jazz. With modern instruments and musical arrangements that highlight his intimate songs, his music is also enriched with Malian instruments such as balafon, tama and the ara'o bara, etc. Ben Zabo's songs are mostly written and sung in Bomu, his mother tongue. The Bwa are an ethnic minority group living in a small territory called Bwatun (Bwa country), which straddles the border between Mali and Burkina Faso. The Bwa of Mali occupy the area southeast of the Segou region, specially encircling San Tominian and serves approximately 216,000 people. The rhythm of the music of Ben Zabo encourages dancing. It is both an expression and assertion of cultural identity. It is also the voice and form of a social conscience and ethical pride. In his compositions, Ben Zabo develops themes relating to social values such as brotherly love, peace, justice, tolerance, solidarity, work and good governance. All of those are for him sustainable human development factors, which remain the only guarantee of integrity and social cohesion. For women, they are not forgotten in the songs of Ben Zabo: a tribute to them is made - to all the mothers of the world - for the suffering they endure while giving birth. He also writes about their beauty, bravery, love, charm and tenderness.